This is just a quick post to explain how I installed the PS3 SDK (PSL1ght) on my windows computer, with also a quick example to compile a homebrew and run it on a 3.55 CFW. This guide will help you install psl1ght and associated libraries on windows. Once installed, you will be able to create homebrews for the ps3 without needing any additional tool (except you favorite text editor). Keep in mind that programming homebrews for the ps3 is much more easy to do on linux, and that by trying to do it on windows, you are already making it harder on yourself. If like me, despite this, you'd rather give it a try on windows, then keep reading. There are many guides on how to install the PS3 SDK, but most of them assume you are running on linux, and the other ones are slightly outdated or incomplete. First of all, I gave up on finding a pure Windows implementation of the PS3 SDK. We have minpsp for the PSP, but I couldn't find something similar for the PS3. The things I found that pretended to be pure "windows" solutions actually shipped with things such as mingw, and overall were not working out of the box (yeah, coming from the psp scene sets high expectations with the tools we have). So I gave up on this idea, and installed cygwin, which is relatively well supported by the PSL1ght toolchain. Installing cygwin is pretty straightforward, just download it here and follow the default settings to install it, but add wget in the list of packages. This will give you access to some cygwin terminals, which are as close as you can get from a *nix terminal without running a virtual machine or installing Linux. 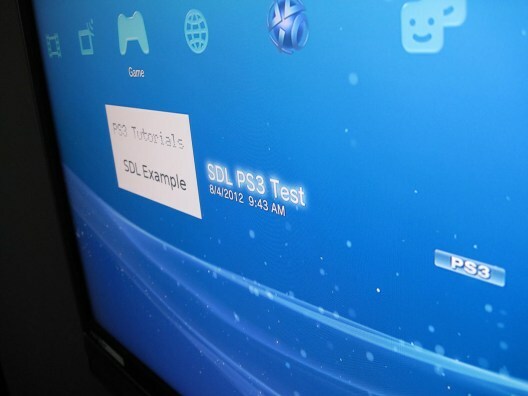 During the build PSL1GHT and ps3libraries will be automatically downloaded and installed. This is a "bug" in the freetype library, which does not create the include folder at the right position. (the include folder ends up in includes/freetype2/freetype instead of includes/freetype). PSL1ght Makefile doesn't set pkgcrypt as executable, this error prevents Python under cygwin to import pkgcrypt module in pkg.py script. There are samples in the /usr/src/ps3dev/build/psl1ght/samples/ folder, but they "only" let you compile self files. This is good, but it seems to me the "best" way to distribute a homebrew is with a .pkg file. Instead of trying and figuring it out by myself how to create a .pkg once I have a .self file which is not my goal for now, I instead downloaded an additional sample from this page. This created a bunch of files for me, including a .pkg file (SDL_PS3_Example.pkg). That's it, your homebrew is installed and ready to run. Many thanks go to alnitak for the 3.55 ps3! Nice tuto. Does this mean you finally got a hacked PS3? Last edited by oam99 on Fri Apr 06, 2018 1:41 am, edited 1 time in total. https://github.com/jevinskie/ps3toolcha ... d-greatest this branch should build ps3toolchain just fine.